In this paper the conceptual frameworks, which make different predictions about the effect of board leadership structure on firm risk-taking behaviour, are examined. From a sample of 243 Australian listed firms, it is found that leadership structure does not have any significant influence on firm risk; higher blockholder ownership or lower dividend payout is related to increased performance variance. 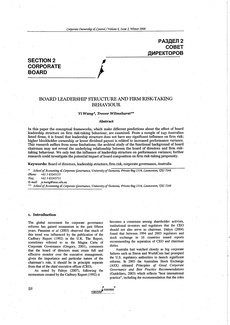 This research suffers from some limitations; the archival study of the functional background of board chairman may not reveal the underlying relationship between the board of directors and firm risktaking behaviour. We only test the influence of leadership structure on performance variance; further research could investiga.te the potential impact of board composition on firm risk-taking propensity.